Windows' built-in system backup program, System Restore, allows you to revert Windows and your applications back to what they were at a previous time without effecting your documents and data. Of course, it doesn't do much good if Windows didn't create a backup (called a restore point) back when your PC was healthy, or if it has since deleted that restore point to make room for a new one. There are really two issues here: How often Windows creates a restore point, and how long it keeps the ones it has. I'll cover creating restore points today, and keeping them next Monday. In addition to these event-driven backups, Windows supposedly creates a new restore point if it has not done so in the last 24 hours. But this rule comes with too many caveats to be dependable. For instance, it won't create one unless the PC is idle. I find it best to assume that these scheduled restore points won't be created at all. So it's a good idea to manually create a new restore point every few days, or before you install a program or alter Windows in any way. You can ease this task by putting an appropriate icon on your desktop or in another convenient location. How you do that depends on your version of Windows. This isn't a perfect solution. After you've launched the shortcut, you'll still have to select Create a restore point, click Next and give the point a name. But that's not too bad. 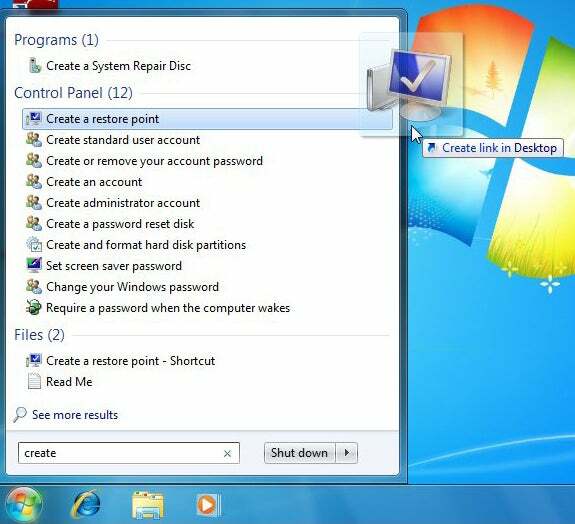 That trick won't help in Vista or Windows 7, where you can't create restore points from the System Restore program. (Whoever thought that was a good idea?) So here are some other solutions. If you're using Vista, I recommend The Windows Club's free Quick Restore Point Maker. This program really is a simple, fast, and workable solution. That is, it's workable as long as you're running Vista. It simply doesn't work with XP. And, in my experience, it does worse than not working in Windows 7--it creates the illusion of working. While it successfully created restore points in Windows 7 for me, System Restore always failed to restore from any of them. The program's web page lists it as Windows 7-compatible. Luckily, Windows 7 lets you setup a shortcut about as easily as does XP. Click Start and type create. Find the icon for "Create a restore point" and drag it to the deskop. When you launch the shortcut, you'll have to click the Create button and follow the prompts.